Do you hate throwing out that overripe banana, wilted lettuce leaves or the avocado that you didn’t get around to eating? Instead of feeding it to a landfill, feed it to some hungry worms. Worms are nature’s recyclers and will turn your “trash” into a rich treasure for your garden and landscape. Worms love to eat fruit pieces and peels (their favorites are bananas, melons, and avocados), vegetable pieces and peels, coffee grounds, tea bags, eggshells and shredded newspaper. Vermicomposting (composting with worms) is pretty simple. Worms eat your food scraps and leave castings (commonly known as worm poop). Worm castings are a nutrient-rich natural fertilizer that improves the health of your soil and plants. Your garden and landscape will thank you. Encinitas resident Diane Hazard began vermicomposting when a friend gave her worms as a birthday present. Twenty-five years later, Hazard has turned composting into a career. Hazard, who has a degree in biology, is a Master Composter, and is a graduate of the UCSD Extension Sustainable Business Practices program, is director of education at Solana Center for Environmental Innovation in Encinitas. 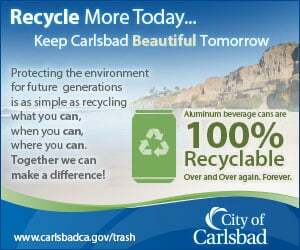 She manages a staff of environmental educators, who spread the gospel of composting throughout San Diego County. For beginners, Hazard thinks vermicomposting is a great introduction to composting. You don’t need much space and it’s contained, which also makes it a great option for people living in urban areas, in condos and apartments. 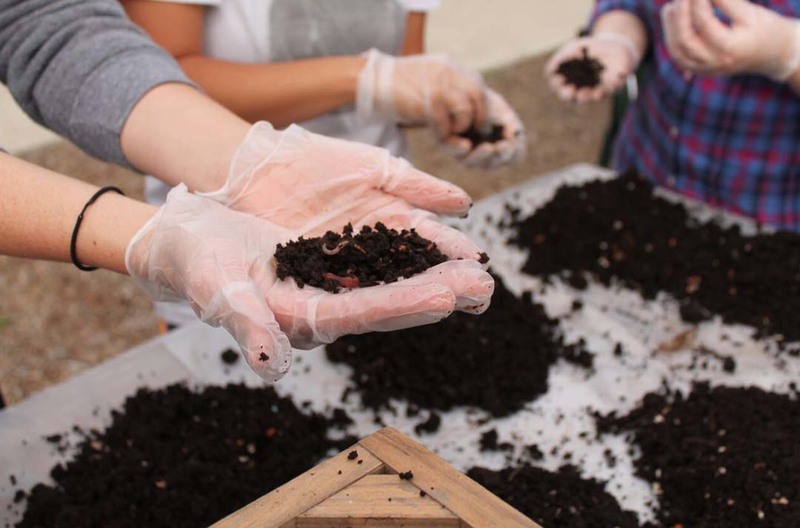 “Vermicomposting is very easy (particularly if you live in areas where (temperature) ranges are not extreme (like Encinitas), not labor intensive, and you get an amazing end product,” said Hazard. Food scraps are valuable organic material that can be recycled to replenish the earth. Vermicomposting allows you to recover those nutrients and prevents organic waste from being sent to a landfill where it releases methane, a potent greenhouse gas. It isn’t just eco-friendly — it saves money. You won’t need to buy expensive fertilizers and it could even lower your water bill — compost retains water by acting like a sponge. Vermicomposting can also be fun and educational for the whole family. What kid doesn’t like worms? Although composting is an ancient agricultural practice, it can be a fairly new concept for urban people. People are often afraid that composting will smell and attract flies and rats, according to Hazard. She said that vermicompost should just smell, well — earthy. When trying anything new, you’re bound to make a few mistakes. Overfeeding is a common mistake that people make initially, according to Hazard. Another option that Hazard recommends is an in-ground free-range vermicomposting system. Your worms can fertilize your garden for you. “It’s basically a 5-gallon utility bucket, drilled with many quarter-sized holes, topped with a gamma lid and buried in the ground of your veggie garden or near the dripline of your fruit trees,” said Hazard. Ready to get started? You’ll need some worms — red wigglers, are the best. You’ll also need a worm bin, some shredded newspaper or coconut coir and some basic info. Solana Center’s main office in Encinitas has everything that you’ll need. Encinitas residents enjoy a deep discount on worm bins, thanks to the city. Solana Center also offers free composting workshops throughout San Diego County and a composting hotline called the “Rotline” for questions. When you’re ready to take your composting know-how to the next level, Solana Center offers a five-week Master Composter course that provides in-depth training in the art and science of composting. The course includes lectures, demonstrations, and a field trip. For local farmers — San Diego County is home to more small farms than any other U.S. county — composting is particularly beneficial. It improves soil health, crop output and water retention. Solana Center is offering a mid-scale composting presentation series called, “Solutions for Organic Waste Diversion” from noon to 5:30 p.m. April 9 at their new Composting Center located at Solana Center’s Eco Learning Lab, standing at the Del Mar Fairgrounds Infield Farm. The site is the only place to see side-by-side working examples of various types of composting techniques, including black soldier fly larvae, aerated static pile, in-vessel composting and vermicomposting solutions. To learn more about vermicomposting workshops and resources, visit solanacenter.org.